Administrative Assignments Teacher In-charge of the Physics and Electronics department for academic year 2016-17 B.Tech Project Coordinator for the academic year 2016-17. Convener of ‘Physics & Electronics departmental Society’ for academic year 2015-2016. Convener of workload committee of Physics & Electronics dept during academic year 2016-2017. Convener of time-table committee of Physics & Electronics dept during academic year 2016-2017. Convener of the library committee of Hansraj College during academic year 2014-15, 2015-16. Worked as Deputy Superintendent of Annual Examination 2009 Worked as Deputy Superintendent of Semester Examinations, Nov 2011. Worked as Superintendent of Physics Practical Examinations Nov 2013, Apr 2015, Nov 2015, Apr 2016 and Nov 2016 Worked as Deputy Coordinator of Central Evaluation Centre at Hansraj College in Nov 13, May 2014, May 2015, Nov 2015. Member of Canteen Committee of Hansraj College during 2008-09 and 2009-10. Member of Environmental Committee of Hansraj College during 2008-09, 2009-10. Member of SC/ST Committee Hansraj College during 2011-12, 2012-13,2015-16. Member of Election Committee Hansraj College during 2013-14. 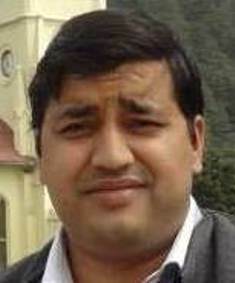 Member of Discipline Committee Hansraj College during 2009-10. Member of Library Committee (Physics & Electronics Department) during academic year 2010-2011. Member of Workload Committee (Physics & Electronics Department) during academic year 2008-2009 and 2012-2013. Member of Infrastructure & Development Committee (Physics & Electronics Department) during academic year 2009-10, 2010-11 and 2012-2013. Convener of Purchase Committee of Physics & Electronics Department during academic year 2012-13,2013-2014. Member of the ‘Placement Cell’ of the College during academic year 2013-14,2014-15 & 2015-16 Co-convener of ‘Physics & Electronics Society’ for academic year 2008-2009. Journals Articles 1)“A Semi Classical Approach to Signature Splitting and signature Inversion in odd –odd Nuclei” International Journal of Modern Physics E, Vol. 20, No. 6 (2011): 1455–1463. 2)“In medium properties of charmed strange mesons in dense hadronic matter” International Journal of Theoretical Physics Vol. 54 (2015):1644–1653. 3)‘Factors affecting beta decay life-time of the isotopes’ international journal of modern theoretical physics, 2015, 4(1) 41-46. 4)Systematics of Ground State Lifetime for Beta Decay’, International Journal of Modern Theoretical Physics, 2016, 5(1) 1-7. 5)A Semi-classical Approach to Signature Splitting and Signature Inversion in Odd-Odd Nuclei’ Proceedings of the DAE Symp. on Nucl. Phys.55 (2010). 6)“A Role of Valence Particles Number Equal to 20 “ Proceedings of the DAE Symp. on Nucl. Phys. 57(2012). 7)“Correlation between ground state lifetime and valence nucleons for isotopic chains of Odd-Odd Nuclei’ Proceedings of the DAE Symp. on Nucl. Phys. 59 (2014). Conference/ Symposium etc. Paper Presented Poster Presentation in the XXII DAE-BRNS HEP SYMPOSIUM Dec 12-16, 2016 at University of Delhi.